Officiating: Review travels, fouls and out-of-bounds and how to quickly resolve calls. Elect Captains: Duty will be to ensure wide participation and fair play. 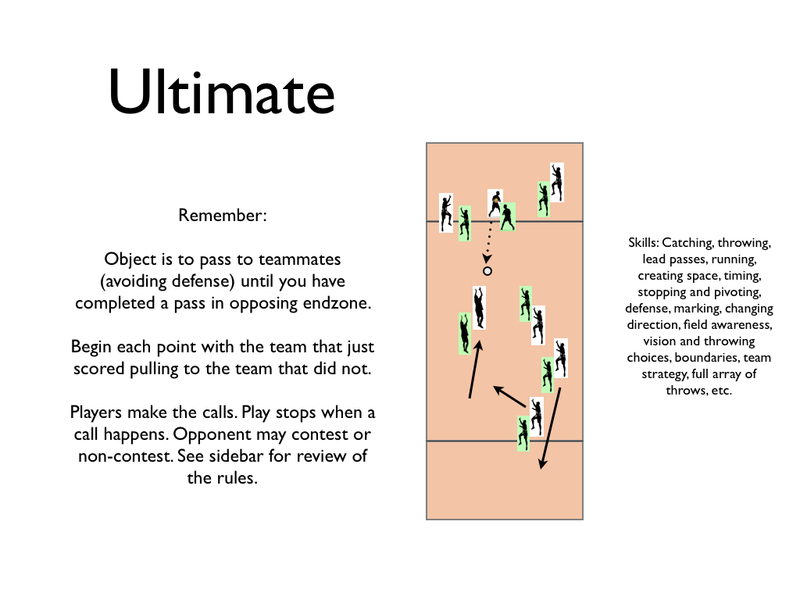 Play Ultimate: Captains flip a disc to randomly decide which team is pulling or receiving; then commence game(s). Captains flip for side and who pulls first. Game to 7, half-time at 4. All points start with pulls (each team stands on its front end zone line while one defensive player throws the disc off to the other team; only after the release of the pull can offensive and defensive players pass their own line). Turnovers result in immediate change of possession; offense becomes defense immediately. Fouls, travels, and out of bounds enforced by players themselves. Switch sides of the field at half-time, and the team that did not pull to start the game must pull.